31 October 2008 Rough sea in Levanto, Liguria (northwestern Italy). 8 October 2011 A policeman stationed in front of the Wall Street stock exchange building. The streets are desert. The Occupy Wall Street protesters are a few blocks away. 8 October 2011 In Zuccotti park, lined-up protesters hold signs in front of passersby. 8 October 2011 Revival of the hippie philosophy in Zuccotti park. 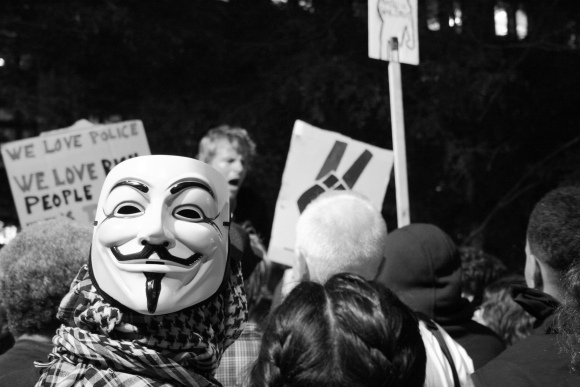 8 October 2011 The Guy Fawkes mask worn by “V,” the anarchist revolutionary in the comic book series “V For Vendetta,” has become a symbol of popular revolution. 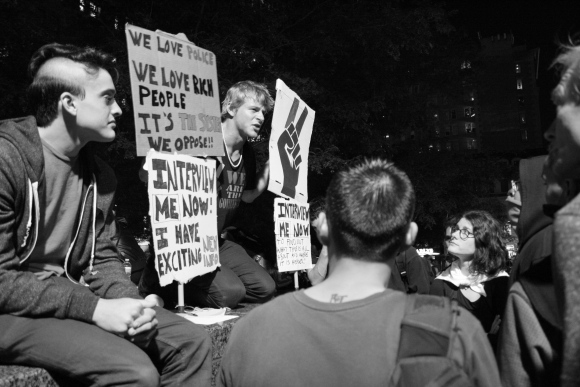 8 October 2011 Two protesters welcome passersby to ask them questions about the meaning and goals of the Occupy Wall Street movement. “We love police. We love rich people. It’s the system we oppose! !” says their sign. 8 October 2011 A young woman listens carefully to a protester explaining his ideologies in Zuccotti park. 8 October 2011 “Interview me now to find out what this is all about and where it is headed! !” says the lower right-hand sign. The young man kneeling over between the signs had a hoarse voice after a day of screaming. 8 October 2011 A prostester leans over dozens of other hand-written signs covering the sidewalk in Zuccotti park. 8 October 2011 A tired protester with a cowboy hat and worn-out soles sleeps leaning his head on a street lamp in Zuccotti park. 8 October 2011 Protesters stop by a street vendor to buy their dinner. 23 March 2008 First spring flowers bloom along Via delle Fonti Solforose, in the small town of Anduins, in Friuli Venezia Giulia (northeastern Italy). 18 October 2011 Felicia Bernabeu, 51, lives in the Ravenswood housing development in Astoria, Queens. 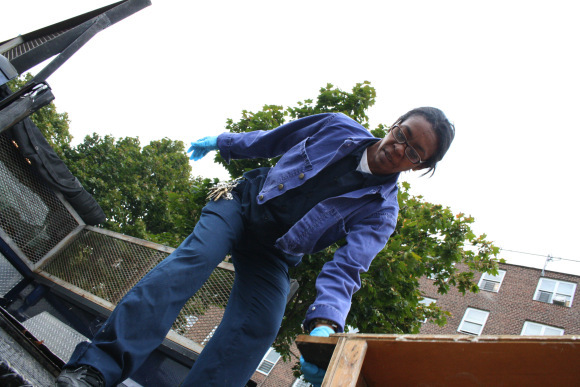 She works for the New York City Housing Authority and cleans apartments when people move out. 18 October 2011 Originally from Cuba, Bernabeu came to the United States when she was 19 with her father, a former political prisoner in Cuba. In the picture, Bernabeu unloads a cabinet she has to bring into an apartment before a new resident moves in. 18 October 2011 When she enters an apartment, Bernabeu has to clean the floor and trash everything the former residents have left behind. 18 October 2011 Bernabeu has never come back to Cuba since she left. She hasn’t seen her mother for more than 30 years. In the picture, Bernabeu unloads the elevator of all the plastic boxes she has found in an apartment. 15 October 2011 Bernabeu and her one-year-old granddaughter. Bernabeu teaches Leilani how to dance and she speaks to her mainly in Spanish so as to raise her bilingual. 15 October 2011 Although she does what’s usually conceived as a man’s job, Bernabeu goes to the hairdresser at least once a week because “I want to look feminine,” she says. 15 October 2011 Alongside her hair, Bernabeu always tries to get her nails done too.